The Town Bird: What dress will you dazzle in during the festive season? What dress will you dazzle in during the festive season? The festive season of India is always a season to sparkle. With this festivity season we welcome plenty of celebrations, fun, holidays not but the least fashion dilemmas too. So, hit the first stone if you have found yourself wondering what to wear on the festivals to avoid rush of last-minute panic as your nights out approach, though, fear not: we’re here to help you. The floral dress of Aishwarya Rai bachchan by our hot favourite all through this season- Manish Malhotra makes a perfet alternative to all the sparkling dresses. The simple and sober choice of outfit and jewellery hit the countdown. Simplicity is the mantra with this look, so keep jewellery, hair and make up to a minimum if you’re going to try a similar look as to not overpower the dress. Way more flattering than most imagine it could be golden and blue transparent sari wore by Katrina Kaif. The jadau jewellery is too damn good making her look even more wonderful. There’s no doubt about it; the festival’s number one trend of Malaika Arora Khan hankered back to the 80’s. She looked absolutely beauty with sober lehenga and full sleeved blouse with a matching duppatta and a neat low centered bun. The jadau neckpiece makes her look rather sexier with no earrings. However, it’s a trend which is here to stay for the long term; well through these festivals at least. 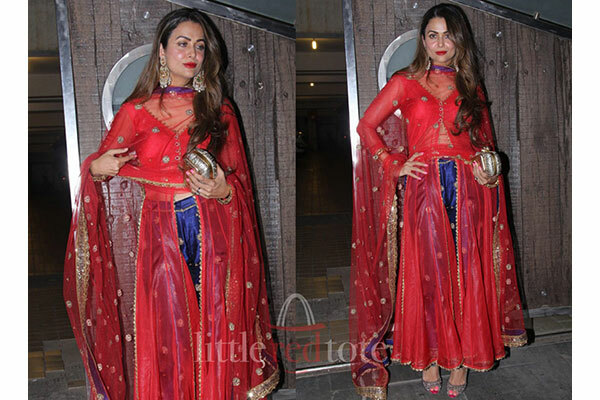 Red will always be a stunning and timeless colour to wear over the festive period, but it’s important for you don’t edge into looking like Amrita Arora in bright red and blue. The red matching lipstick along with the statement earrings make her style more flattering than most imagine it could be. If you are frantically looking for some open bottoms like plazzao then the elegant pink kurta with white plazzao wore by Karishma Kapoor an easy choice for those wishing to go simple this festive season. The earrings you see is very light weight and you can carry it with ease. Whether you prefer a sophisticated or glitzy look, treat yourself not less than a festive princess, and, of course, keep calm and party on!